One of the oldest light stations on Lake Huron is located on Thunder Bay Island Thunder Bay is the outermost island in a group of islands connected to the north point of Thunder Bay by a shallow bank of numerous rocks, most of which are submerged. The light tower was first constructed in 1832 and was built to warn mariners of the dangerous reefs extending from the island Squatters were attracted to the federally-owned island and by 1845, a large fishing community thrived there. One hundred and sixty people lived on the island with thirty-one fishing boats harvesting twelve thousand barrels of fish each year. Faced with government action to remove them from the island, the trespassers picked up their belongings and relocated to nearby Sugar Island, where they stayed for years. NOTE! Access to the island is limited to the U S Coast Guard, U S. Fish and Wildlife Service, and members of the Thunder Bay Island Preservation Society. 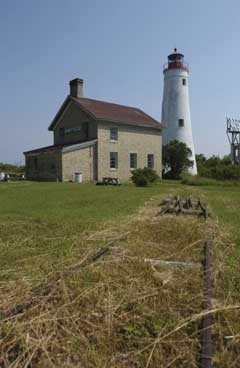 However, lighthouse is visible from the water. Contact the preservation society at (989) 356-6743.